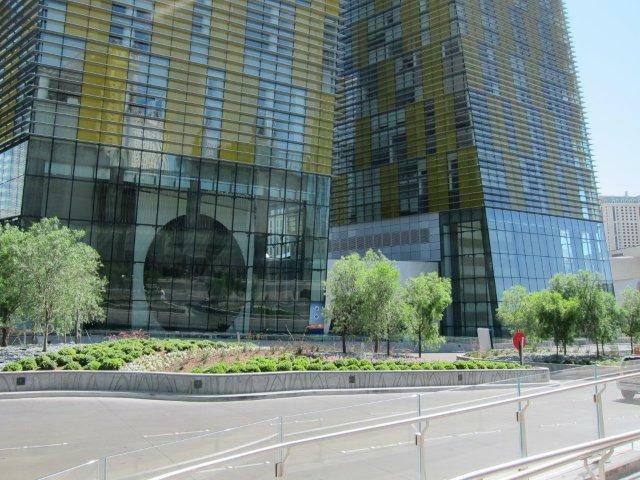 GAD and I just got back from visiting Las Vegas and stayed at City Center, a relatively new development that sits slightly off the strip. In general, Las Vegas turned out to be everything I wanted and expected: kitcsh architecture, decadent meals, and never ending cleavage. When planning this trip I asked around about art museums in Vegas? Apparently this was a joke? Like everything else in this city, I found out that Vegas has an extreme relationship with art. Just like lady luck — sometimes it’s on and sometimes it’s off. 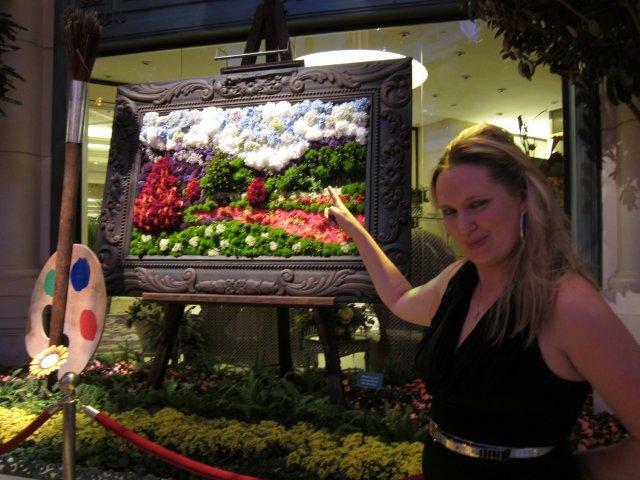 I admit that much of my experience of looking at art in Vegas was a yawn. In fact, on my first night, the Bellagio tried to trick me into thinking this was a real art-in-progress, but I was not fooled. Next day, I started noticing “fine art” around me. First, there was a whole gallery devoted to Richard MacDonald who has done zillions of sculptures of Cirque dancers – as if Vegas didn’t have enough Cirque already. This brings to mind my adoration for Thomas Kincade…. Next there was the Bellagio Gallery of Fine Art which was showing landscapes from Monet to Hockney. Really? (apologies to the Monet fans out there). But — come on. Here you are in the Bellagio, a veritable playground of materials and spaces that invite imagination and you want me to be excited about Monet? I swear, there is food more exciting than those paintings. 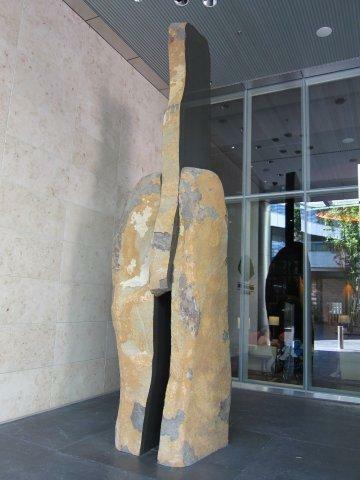 However, after the third hand – I did find something that inspired me — the public art holdings at City Center. The next is a series of videos and photos of the collection – your own personal art tour. 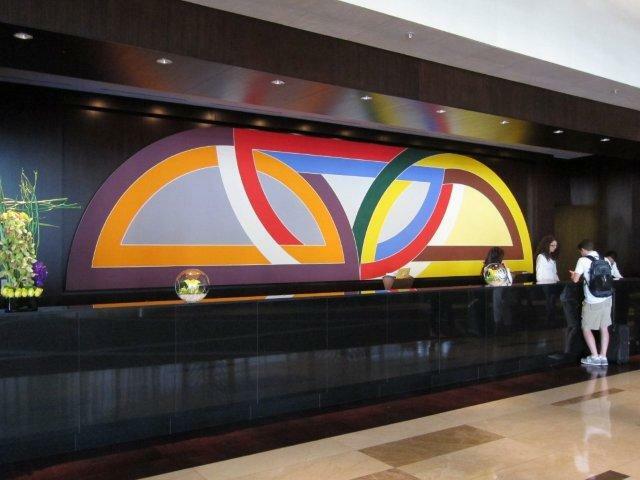 Here is Frank Stella’s “Damascus Gate Variation I” (1969) which hung over on the Vdara Hotel reception area. 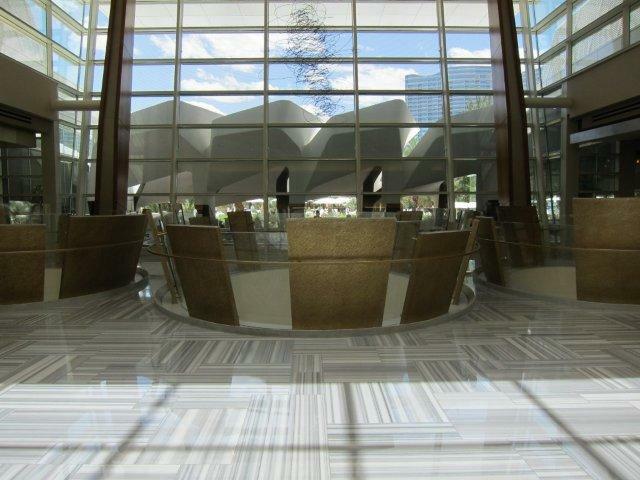 Aria, which is Vdara’s sister hotel, commissioned Maya Lin to create a hanging sculpture over their reception area. The work “Silver River” (2009) was based on the relationship between Las Vegas and the Colorado River. If you look carefully at the image below, you should be able to see the silver streak hanging overhead. No matter how many times I see his work, Henry Moore always moves me. 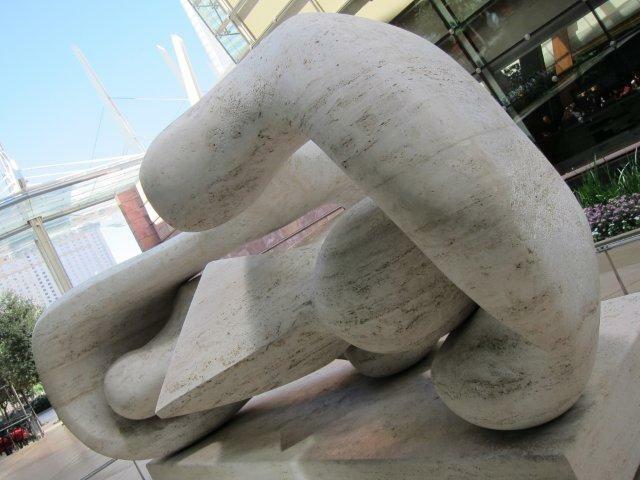 His piece “Reclining Connected Forms” (1969 – 1974) was located outside Crystals, the City Center shopping center. 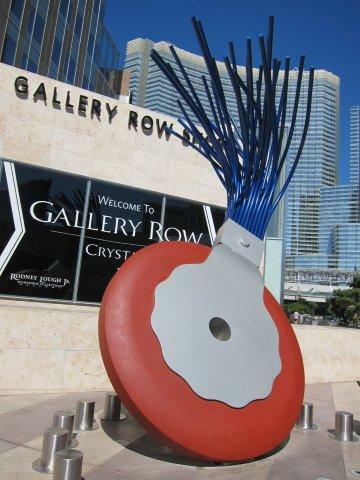 Here’s a fun one – “Typewriter Eraser, Scale X” (1998 – 1999) by Claes Oldenberg and his wife Coosje Van Bruggen. 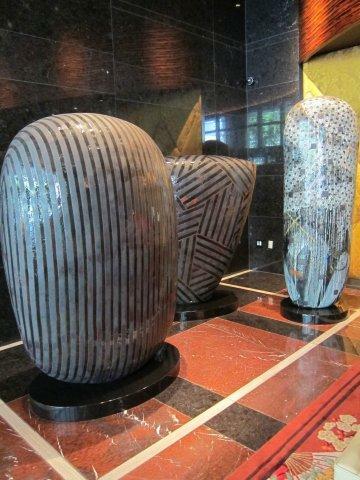 Next we move to the Mandarin Oriental Hotel. 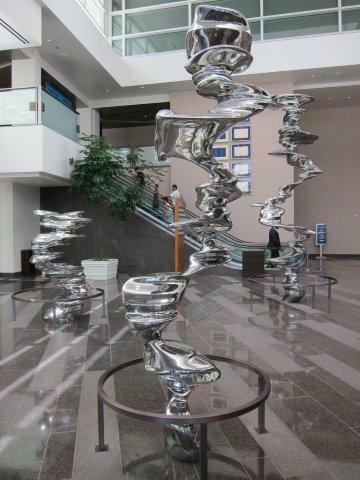 First piece is at the valet — Matsatoshi Izumi’s “Untitled” (2007 – 2008). 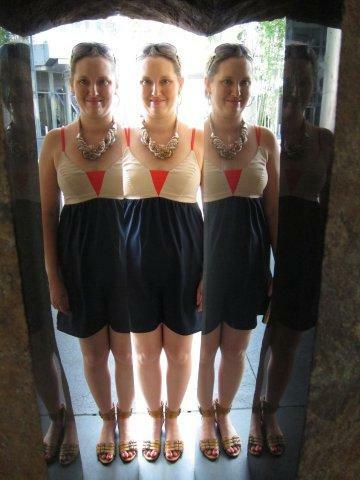 Below is a photo of the piece and then what happens when you look through it. 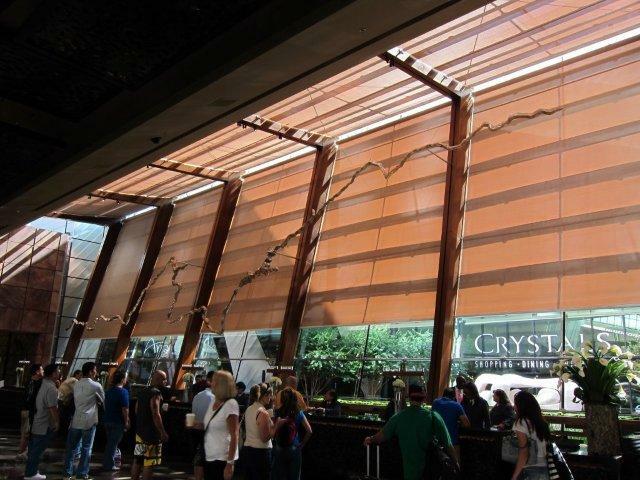 Back at the Aria, here is a projection piece that we almost missed completely: Jenny Holzer’s “Vegas” (2009). How awesome to pick up your car from the valet and get to see this. If you listen carefully you will also hear my rendition of “Genius of Love” by the Tom Tom Club – that’s at no extra charge! 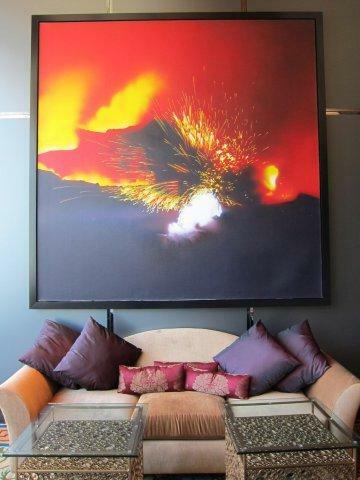 Prev Las Vegas – Art or Decor? Next Cry Me A River — Justin or Michael — you choose!